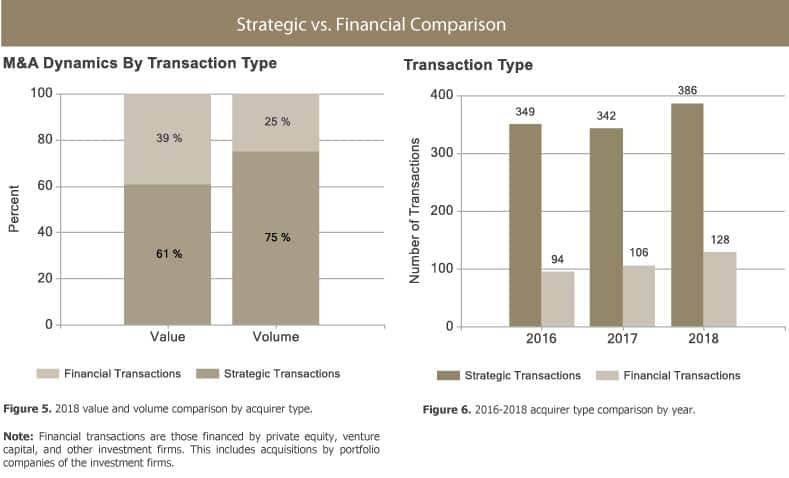 Full Year 2018 Finance M&A Trends Report - Berkery, Noyes & Co., LLC. Three of these deals were completed by SS&C Technologies: DST Systems, a provider of specialized technology, strategic advisory, and business operations outsourcing, for $5.64 billion; Intralinks Holdings, which offers secure data sharing and enterprise collaboration solutions that are used by the banking and capital markets sectors, for $1.5 billion; and Eze Software, an investment management software solutions company, for $1.45 billion. 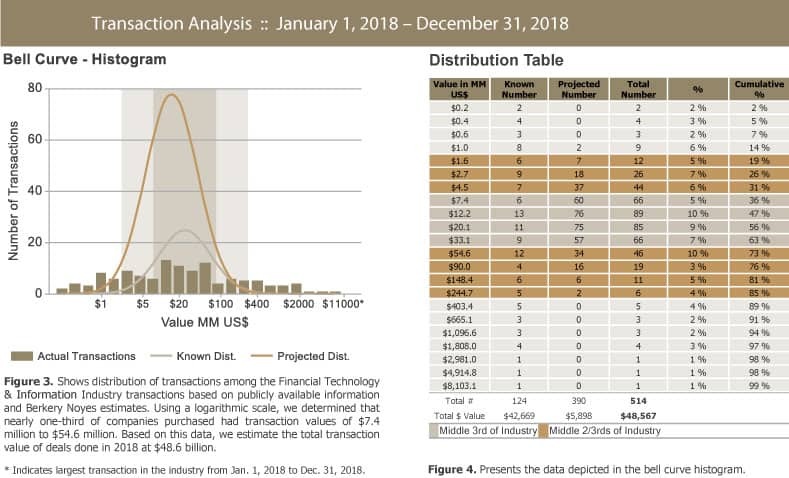 There were 129 financially sponsored transactions with an aggregate value of $18.94 billion, representing 25 percent of the total volume and 39 percent of the total value, respectively. 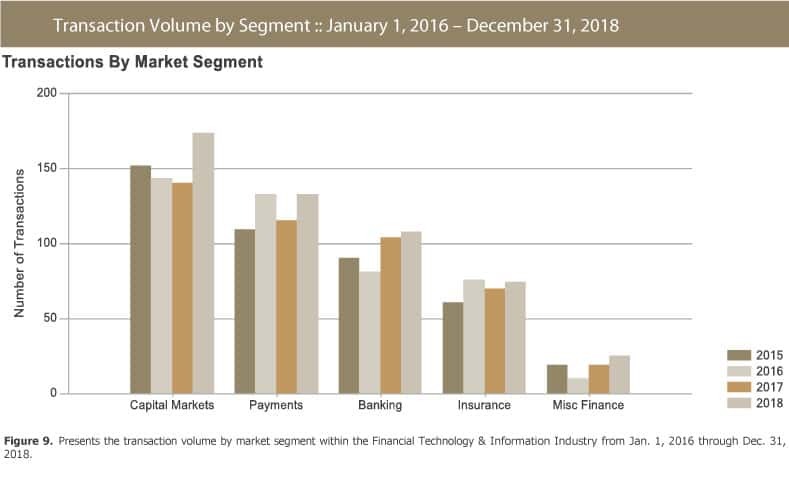 Total transaction volume in 2018 increased by 15 percent over 2017, from 448 to 514. Total transaction value in 2018 rose by 12 percent over 2017, from $43.29 billion to $48.57 billion. 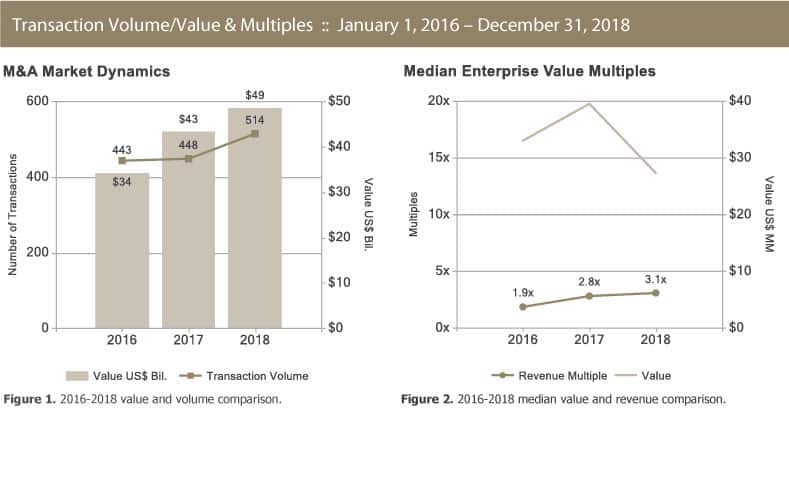 The median revenue multiple improved from 2.8x in 2017 to 3.1x in 2018. Berkery Noyes tracked 1,405 Financial Technology and Information transactions between 2016 and 2018, of which 328 disclosed financial terms, and calculated the aggregate value to be $106.36 billion. Based on known transaction values, we project values of 1,077 undisclosed transactions to be $19.32 billion, totaling $125.68 billion worth of transactions tracked over the past three years. 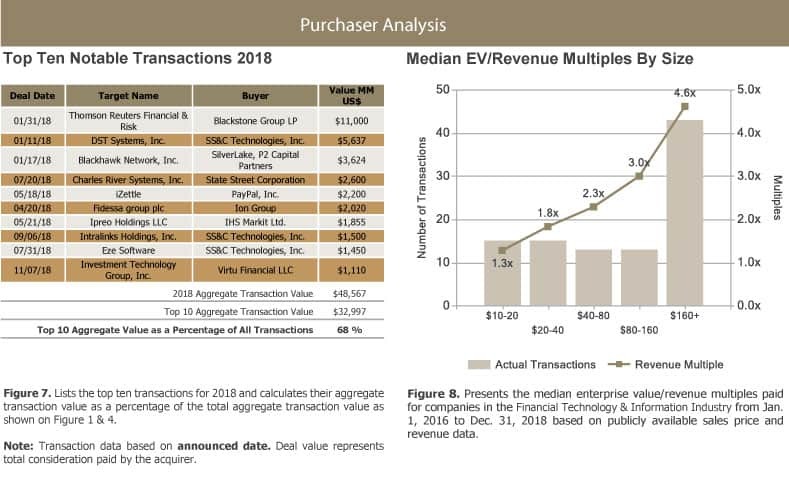 Disclosed median enterprise value multiples for all segments combined in this report during the last 36 months were 2.7x revenue and 14.0x EBITDA. The largest Financial Technology deal tracked by Berkery Noyes between 2016 and 2018 was a Blackstone Group led consortium’s announced acquisition of a 55 percent stake in Thomson Reuters Financial & Risk division for $11 billion in 2018.